Please help our members raise funds for the families of fallen officers. The Freehold Borough PBA is teaming up with the Marlboro Township PBA on March 19, 2015 to host a fundraiser at the Fireside Grill. The Fireside will be donating a portion of each meal toward the Police Unity Tour. The Police Unity Tour is a joint program where officers from all over the northeast ride to Washington D.C. by bicycle. 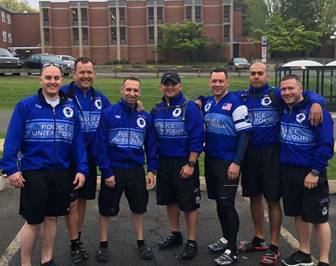 The leg for our officers is approximately 300 miles over three days. The effort honors officers who lost their lives in the line of duty and raises money for the National Law Enforcement Officer's Memorial and Museum. The Police Unity Tour has raised over 17 million dollars to support the National Law Enforcement Officers Memorial. We have also been able to provide financial support to the families of officers that have given the ultimate sacrifice including Trooper Marc Castellano and Patrolman Christopher Matlosz. Our hope is that you will be able to help support this event and this year’s honorees as we prepare for the 2015 Police Unity Tour and our ride to the National Law Enforcement Memorial. To learn more, please email us at marlboropoliceunitytour@yahoo.com.